I saw the saying above on one of my favorite bloggers instagram and thought it was so honest & hilarious. 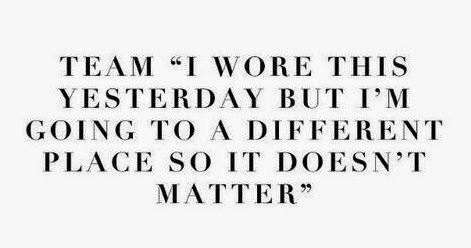 I am definitely guilty of wearing the same outfit a few times especially those that I feel good in. I am so incredibly picky when it comes to my clothing that when I find something I love, I usually buy it in two colors. This was definitely the case with this wrap top I have been living in all winter long. I loved it so much I also gifted it to my sister at Christmas. I have always been drawn to wrap tops, I find them flattering around the torso and just a bit more interesting then a basic silk blouse. I also keep seeing that the "new" styling trick on how to wear a basic button down blouse as a faux wrap by crossing over the sides and buttoning them at the cleavage & tucking them in to hold in place like Sienna Miller did below. To get the look for yourself, shops some of my favorite wrap style blouses. That quote is perfection, I do the same thing ALL the time!! happy to hear I am in good company!